Say Hello to 2011 with the most impressive, and comprehensive, free BMC theme to arrive at Wikidot yet. Complete with custom buttons, comments, quote & code blocks and hovertips, owindows and a fully customisable layout, the Hello theme will entice you to give your site a fresh new look for the new year. The theme is a fixed width of 960px, and the sidebar can be positioned on the left, right or not shown at all. This theme is based on a PSD template by Orman Clark of premium pixels. You can change the way the theme appears by adding the following code snippets to either individual pages or a live template. If you use a custom footer on your site, you may need to adjust the height of the footer's background. To do this, adjust the height property as shown below. January 4, 2010: First release (v1.0). 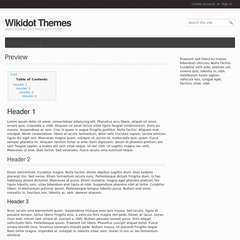 If you've noticed a bug with the theme, or would like to give some suggestions, just head over to http://css3.wikidot.com/contact:themes - we'd love to hear from you. It looks good so far. May I suggest making the black sections (top-bar, footer & strip at top of the page) not quite as dark - the contrast is a little hard on the eyes. Very good suggestion, I was thinking that. This is a really nice looking theme, you did a great job! I like the clean, minimalistic, modern look. This is a FANTASTIC theme. It really gives my site the professionalism it needs. A BIG Thank You to the creator(s) of this! also, how can I expand the page beyond the 960 pixels in width? …or is that opening a big can of worms?